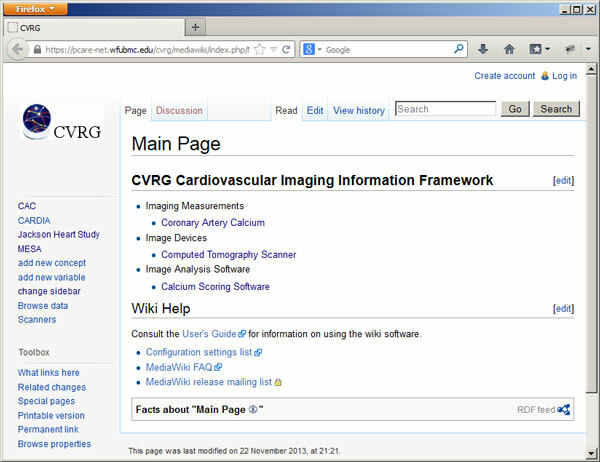 The CVRG Cardiovascular Imaging Framework Semantic Media Wiki (here) is a community forum containing descriptions of NHLBI-supported imaging studies and study variables. Descriptions include study goals, sites, exams, important papers, scanner types, image processing methods, definitions of key variables extracted from review of study publications, and their corresponding names in the study data dictionary. The site supports addition of new studies, other concepts, and variables. The site provides a discussion forum for comments on data entries. Use of this framework should be acknowledged as “Development of the CVRG Cardiovascular Imaging Framework is supported by the NHLBI Cardiovascular Research Grid Project (R24HL085343)”. Contact Dr. J. J. Carr (j.jeffrey.carr@vanderbilt.edu) for additional information.